user warning: Table 'drupalgastronomer.comments' doesn't exist query: SELECT COUNT(*) FROM comments c WHERE c.nid = 111 AND c.status = 0 in /home/dgabriner/gourmetgastronomer.com/modules/comment/comment.module on line 992.
user warning: Table 'drupalgastronomer.comments' doesn't exist query: SELECT c.cid as cid, c.pid, c.nid, c.subject, c.comment, c.format, c.timestamp, c.name, c.mail, c.homepage, u.uid, u.name AS registered_name, u.signature, u.picture, u.data, c.thread, c.status FROM comments c INNER JOIN users u ON c.uid = u.uid WHERE c.nid = 111 AND c.status = 0 ORDER BY c.thread DESC LIMIT 0, 50 in /home/dgabriner/gourmetgastronomer.com/modules/comment/comment.module on line 992. For this January cook-off, I have chosen to prepare Potato Gnocchi, a traditional Italian winter dish, served with a hearty cheese sauce. The combination of potato and cheese is a universal palate pleaser, and is also seasonally appropriate. However, it is not what one would traditionally think of as ‘Mac and Cheese.’ I like to challenge food categories, so I decided to make this dish as my entry into the Gourmet Gastronomer Cookoff. Though it contains potatoes, ask any Italian and they will tell you that Gnocchi is a type of pasta. Topped off with a gooey three-cheese sauce, this combination more than fits within the Mac and Cheese category. This dish is best enjoyed fresh from the stove, however the gnocchi dough can be prepared in advance and refrigerated overnight if desired. This recipe serves six, and is excellent with a fresh Caesar salad. 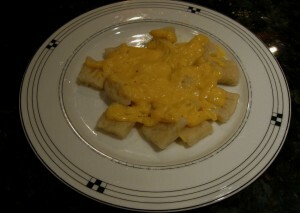 Gnocchi with Three-Cheese Sauce Ingredients: For the Gnocchi~ 3 large russet baking potatoes (about 8 cups), cut into half-inch cubes 2 egg yolks, beaten 2 1/2 cups flour 1/2 tsp. Salt Flour for dusting For the sauce~ 4 tbsp. butter 3 cups grated cheddar cheese 1 cup grated fresh Parmesan cheese 1 cup grated fresh Pecorino cheese 2 cups milk Ground pepper to taste Instructions: For the Gnocchi~ Bring two large pots of lightly salted water to a rolling boil. Boil potato cubes until soft (about 25 minutes), stirring intermittently. Remove potatoes from water and drain. Do not allow to fully cool. Using a potato ricer or potato masher, smash potatoes until mashed. Add the salt to the flour and pour one half of the flour mixture over the mashed potatoes. Using your hands, mix in flour. 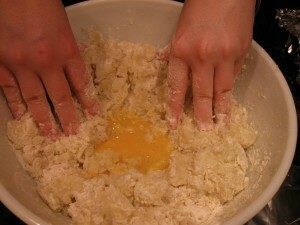 Add remaining flour mixture and egg yolks and mix until a dough forms. Lightly dust a flat surface with flour and grab a handful of dough. Roll the dough into a half-inch thick cylinder. Cut this cylinder into pieces about one inch wide. 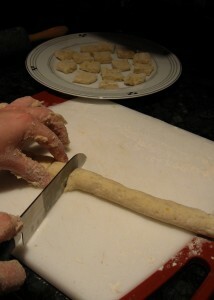 (At this point, you may add a decorative touch if you like, using a fork to press into each side of the gnocchi, creating a ribbed pattern.) Drop your gnocchi into the second pot of boiling water, and allow them to cook only until they rise to the surface of the water. Remove with a slotted spoon and drain. For the sauce~ Melt butter in a saucepot over a low flame and add the milk. Keeping the flame low, allow liquid to heat gently. 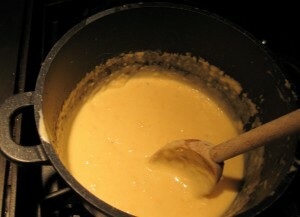 Stir in 1/3 of each cheese and allow it to melt into the sauce, stirring constantly. Repeat this process until all the cheese is mixed in, adding ground black pepper to taste as you stir in the last third of your cheeses. Remove from heat and serve over Gnocchi immediately.